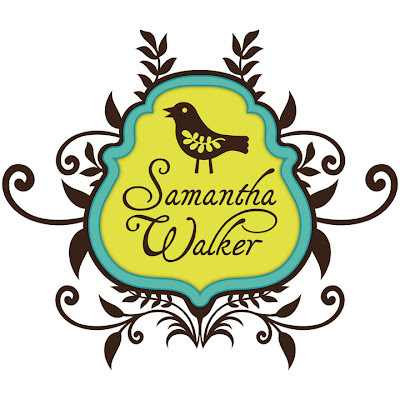 My Fantabulous Cricut Challenge Blog #122: Smore’ Anyone? Happy Monday everyone! Today I have one of my favorite hats on, and that is being a design team member on the awesome Fantabulous Cricut Challenge Blog featuring this card for FCCB’s Monday Challenge #122. I have to say, I was a bit apprehensive I could pull off this concept, but after swimming 1,200 freestyle meter workout and designing a card in my head, this is what I came up with (I am currently training for a mile ocean swim for a triathlon that I am competing in as a relay member and designing cards and other projects in between flip turns helps make the work out go by fast… since you can’t wear your Ipod in the water). This card is going to be a birthday card for the hubs that we will be celebrating in a week. We love camping and he built a custom teardrop camper for us to honeymoon in 7.5 years ago. He did not use plans, he just took the profile dimensions that he found from a 1948 Popular Mechanics issue. It took him about 3 months to build and most of this project was powered by ebay. I used the teardrop as my inspiration and covered a cut from Going Places Cricut cartridge with aluminum foil (a bit more tricky that I thought it was going to be – aluminum foil is very temperamental). I think he is going to love this card! Head on over to FCCB and check out this week’s challenge and get inspired to creat a fun summer time project! Thanks for sharing a piece of “gotta love smore’s” pie with me! 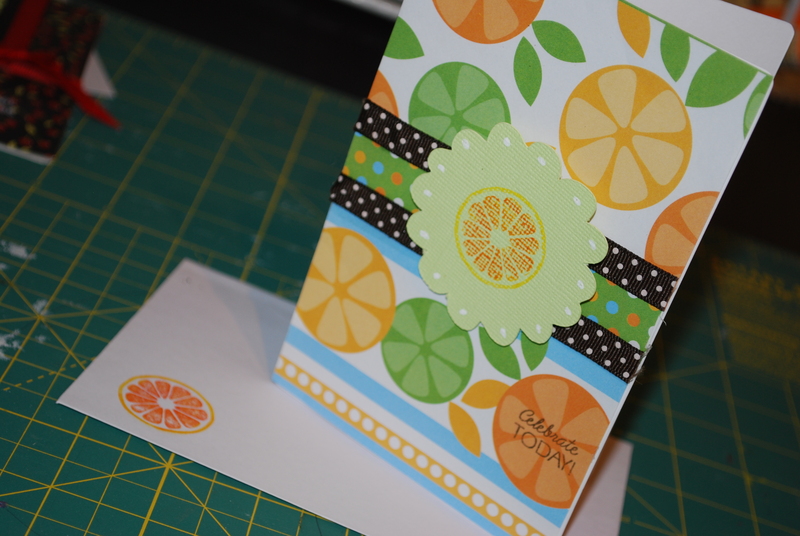 Card: (fits in an A2 enevelope) 12 inches long by 4.25 inches wide scored at 4 and 8 to make the tri fold. I used Martha Stweart’s Score Board for this. ATG, 3M clear fast dry adhesive, Pop Dots. Posted in Cricut Cartridge: 3 Birds on Parade, Cricut Cartridge: Going Places Cricut Cartridge, Cricut Cartridge: Potpourri Basket Cricut Cartrdige, FCCB(Fantabulous Cricut Challenge Blog) Design Team Projects, My Pink Stamper: Birthday Doodles, Pie's Cricut, Pie's Tips and Tricks and tagged aluminum foil in projects, camping cards, camping crafts, cards for men, crafts with teardrop trailer inspirations, fantabulous cricut challenge blog design team, home built teardrop trailers., how to make a tri fold card, teardrop trailers, tri fold cards. Bookmark the permalink. 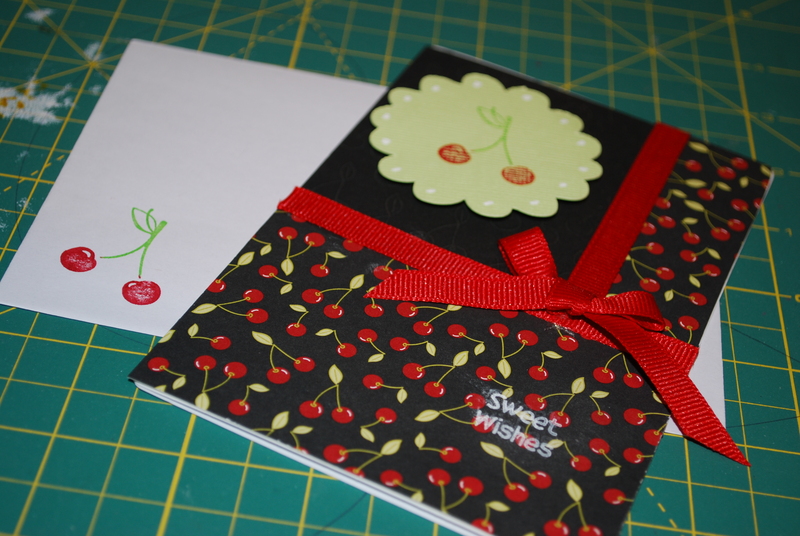 More Fun Cards and Gift Ideas . . . I find it hard to mak cards for grown men. My husband’s sister and family were in from out-of-town and both his sister and her husband’s birthday are this month. They came over for dinner last night and I whipped together these two cards and gift ideas yesterday kind of on the fly. They loved them and the card was not too girly for a manly man! Ribbon – even though there was no brown in the actual paper theme, I thought it complemented the theme and added some masculinity to it. Tin gift box with window – Michael’s – He loves M&M’s so I filled it with those. Scallop was from Storybook Cricut Cartridge (Shadow Setting -M) I made it at 2 inches. I used Martha Stewart craft markers to color the stamps. 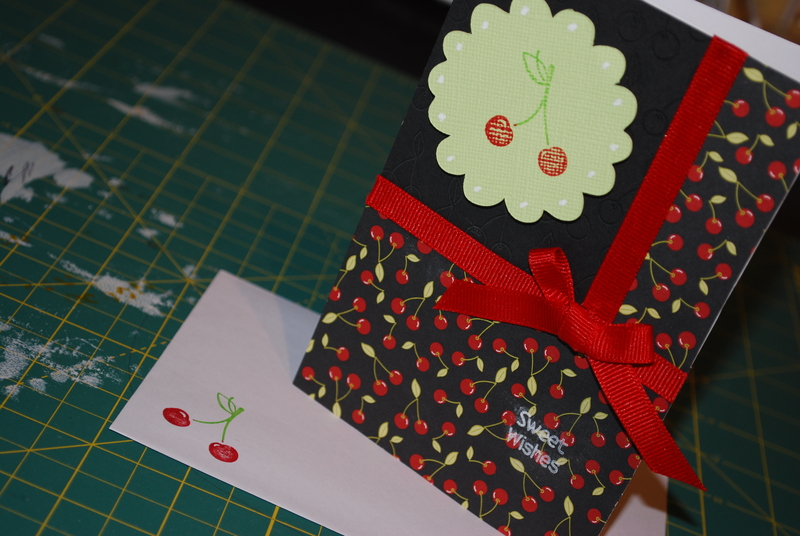 Cherry Card: I added a loose tea leaf ball that she could use for brewing her loose leaf tea that she wanted. 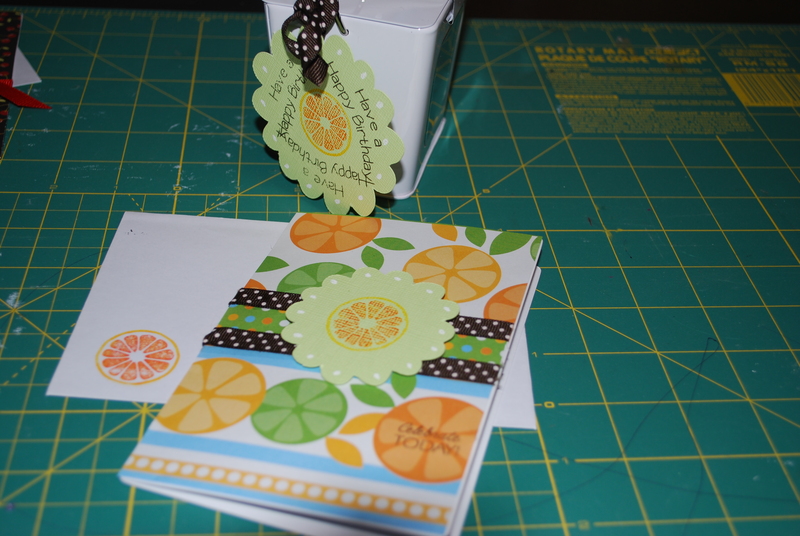 Posted in Cricut Cartridge: Storybook Cricut Cartridge, Pie's Craftiness, Pie's Cricut and tagged cards for men, Citrus themed card, Cricut Storybook Cartridge, Die Cuts with a View, gift ideas, making cards for men, Stampin Up, Tart and Tangy Stamps from Stampin' Up, The Pink Stamper. Bookmark the permalink.